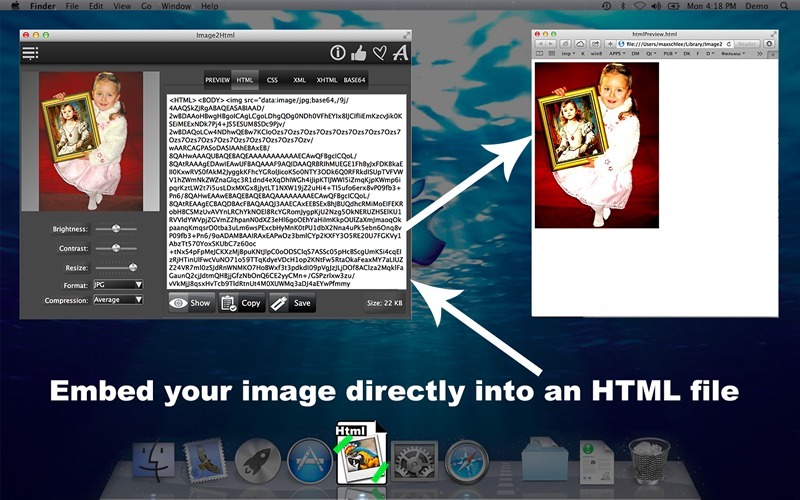 Embed your image directly into an HTML file for emailing. Is there a better alternative to Image2Html? Is Image2Html really the best app in HTML category? Will Image2Html work good on macOS 10.13.4? Image2Html will embed your image directly into an HTML file for emailing. You don't have to link to an external file, and those images can be even viewed offline - no Internet connection necessary! You can determine your image resolution and file size, adjust its brightness and contrasts, select the right format for your embedded image (jpeg, png) and preview the compression artefacts as you go. Preview your image in web browser, Copy and Paste created content in any editor, or Save it as a file. Additionally, Image2Html can convert your images into CSS, XML, XHTML and BASE64 formats. Image2Html needs a review. Be the first to review this app and get the discussion started! Image2Html needs a rating. Be the first to rate this app and get the discussion started!